These workshops are pre-booked online, but any remaining tickets are available for sale from the Workshop Enquiries desk, situated on the corner of aisle P. Note: it is important to arrive at your Workshop Room 5 minutes before the start of your workshop. (Please book carefully as these workshops are non refundable or transferable). 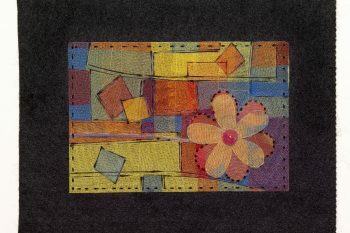 Sewing for Pleasure and The Creative Craft Show! 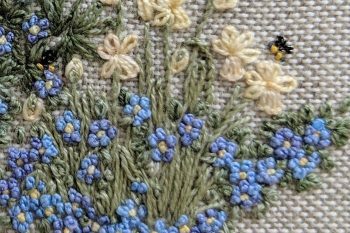 Learn basic embroidery stitches including stem stitch, buttonhole stitch, chain stitch and French knots to create this simple little cluster of flowers. Suitable for a beginner. Online booking is closed for this workshop. Tickets are still available. Please go to the Stitching Den to book at the show. Blackwork was traditionally associated with clothing embellishment and motifs were usually inspired by the natural world and worked in a repeated counted pattern. This contemporary approach uses traditional geometric patterns in varying thickness of black thread to create an interesting and quirky piece. 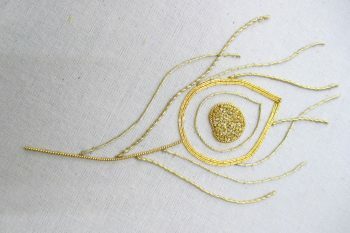 This delicate flowing feather design will introduce students to the basic Goldwork techniques of padding, couching and chipping whilst using Japanese thread, Rococo, Twist, Pearl Purl and Bright Check. 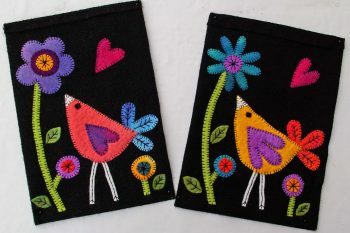 Start to stitch one of these cheerful and colourful bird designs using felt and simple hand stitches. The project can be finished off at home to make a small gadget case, book cover, or bag. Suitable for beginners. 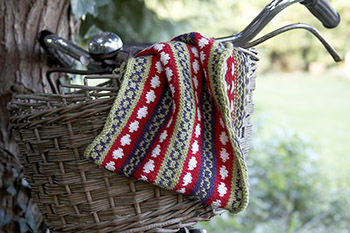 A chance to discover and practise some of the most popular stitches of mid-century Swedish embroidery. You will be using linen threads on linen fabric, with patterns from the Nordiska archive. 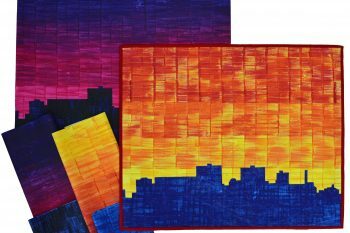 Learn how to use textile inks to print and paint the fabrics used in these colourful, abstract cityscapes. 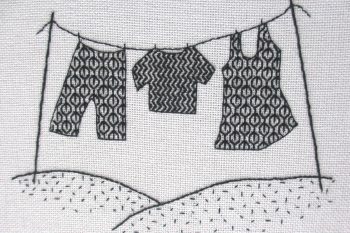 A kit will be provided with Bondaweb and full instructions for finishing your wall hanging at home. Change colours without having large loops at the back of your work. Use colour to create patterns effectively. 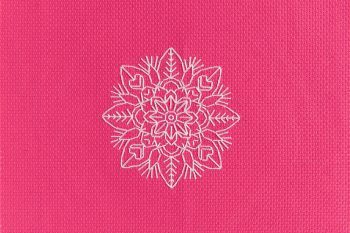 Enjoy an hour of deep mindfulness mandala making with this beautiful backstitch project brought to you with love by Mr X Stitch. This design is elegantly symmetrical, yet it requires sustained attention and is therefore a powerful tool for allaying the thoughts and fears that may flow through your brain. 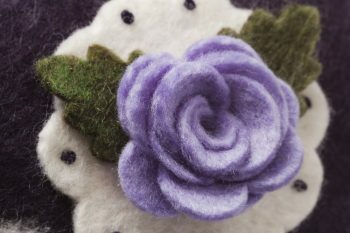 Come and Join author Lisa Marie Olson on this short course and learn how to make a no sew rose, just like the ones in her book Felt Wonderland. You can then use your rose to adorn a bag, project or make it into a brooch. No experience necessary and all materials are included. 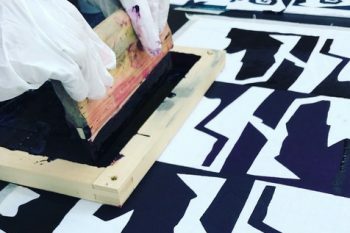 Instantly create a stunning image and print onto fabric – it’s a technique you’ll be able to replicate at home. You’ll create a sample and a tote bag to take away. All materials and supplies will be provided. 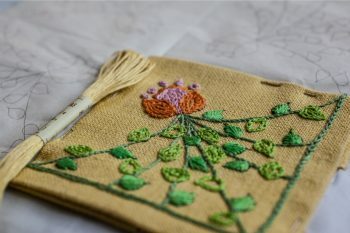 Discover how the fine tipped soldering iron has become one of the most creative tools available to textile artists, embroiderers’ and crafts people today. This workshop is especially for those of you who want to learn how to draw with your sewing machine needle. After an initial practice, you will be guided in how to produce a simple line drawing of daisies. A handout of instructions together with Richard’s demonstration will empower you to develop the picture at home. Not suitable for beginners. 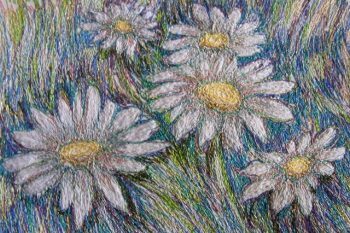 PLEASE NOTE: The daisy image featured is a finished design to show what can be achieved with more time at home, not during this class! Learn how to free-motion embroider images without fear with the help of a stitchable free-motion embroidery design. 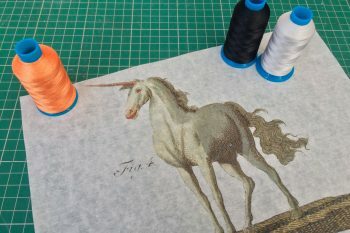 In this session you will embroider a unicorn. Absolute beginners welcome as well as those with experience who want to try the technique. 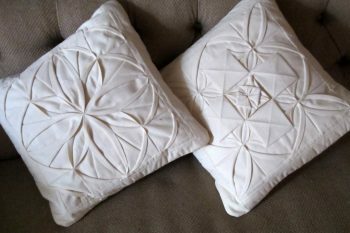 Learn how to ‘draw’ with your sewing machine. 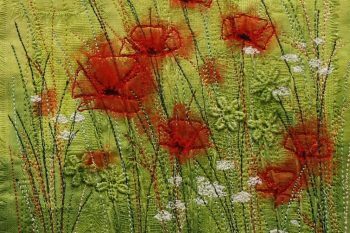 You will be shown how to use a basic domestic sewing machine and working on a simple painted background, you will design and create a small, individual flower meadow picture, with freehand machine embroidery and applied fabrics. Be inspired to have a go on your own machine at home. No experience necessary. Nip, tuck, roll and fold for some material magic! Create a cushion cover, or a panel for a bag or even a quilt with these novel nifty notions. Come and twiddle and tweak with the one and only Calico Queen Jennie R! Ideal for all ages and abilities, no experience needed.